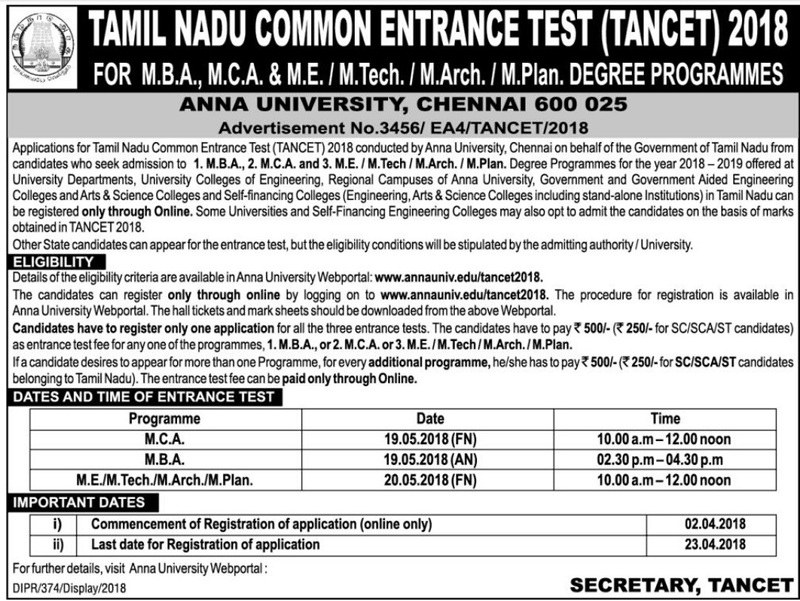 Applications for Tamil Nadu Common Entrance Test (TANCET) 2018 conducted by Anna University, Chennai on behalf of the Government of Tamil Nadu from candidates who seek admission to 1. M.B.A., 2. M.C.A. and 3. M.E. / M.Tech. / M.Arch. / M.Plan. 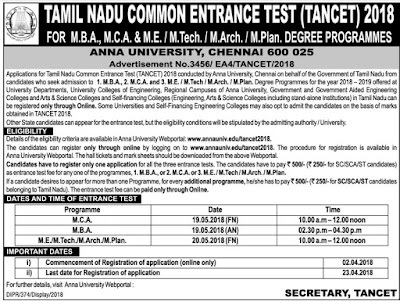 Degree Programmes for the year 2018-2019 offered at University Departments, University Colleges of Engineering, Regional Campuses of Anna University, Government and Government Aided Engineering Colleges and Arts & Science Colleges and Self-financing Colleges (Engineering, Arts & Science Colleges including stand-alone Institutions) in Tamil Nadu can be registered only through Online. Some Universities and Self-Financing Engineering Colleges may also opt to admit the candidates on the basis of marks obtained in TANCET 2018. Other State candidates can appear for the entrance test, but the eligibility conditions will be stipulated by the admitting authority / University. The candidates can register only through online by logging on to www.annauniv.edu/tancet2018. The procedure for registration is available in Anna University Webportal. The hall tickets and mark sheets should be downloaded from the above Webportal. Candidates have to register only one application for all the three entrance tests. The candidates have to pay 500/- ( 250/- for SC/SCA/ST candidates) as entrance test fee for any one of the programmes, 1. M.B.A., or 2. M.C.A. or 3. M.E. / M.Tech. / M.Arch. / M.Plan. If a candidate desires to appear for more than one Programme, for every additional programme, he/she has to pay 500/- ( 250/- for SC/SCA/ST candidates belonging to Tamil Nadu). The entrance test fee can be paid only through Online. M.C.A: 19.05.2018 (FN) 10.00 a.m. - 12.00 noon M.B.A 19.05.2018 (AN) 02.30 p.m. – 04.30 p.m.